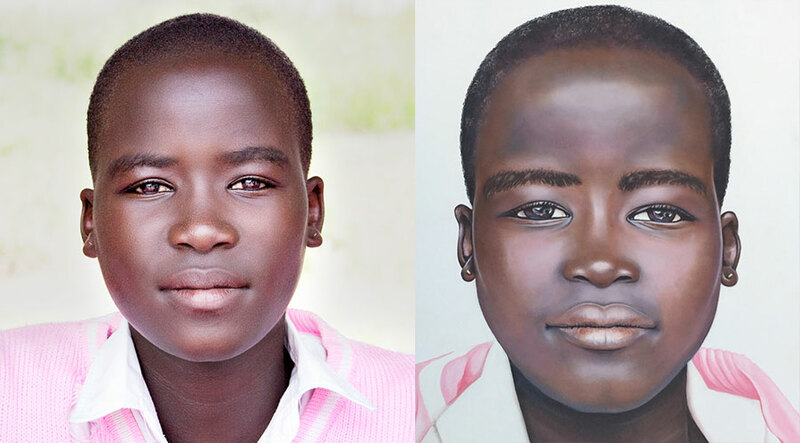 I came to know Beatrice from the candid photo we took of her in Uganda in 2014 (above). I hadn’t yet met her or talked to her, but her image became frozen in my mind. I didn’t know then the incredible reach and global connections that would be made from this one image and moment. Six months later when I was back in Uganda in early February I made a point of sitting down with her to learn more. 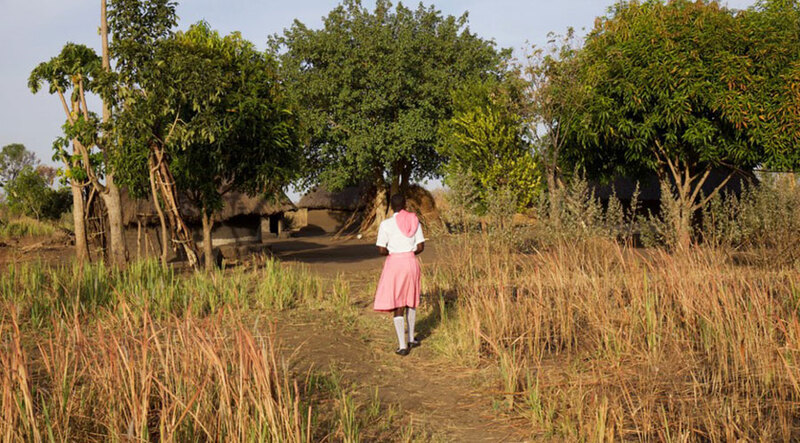 She was being raised by her grandparents who owned a couple of huts a few miles from the school, and did what they could to earn her school fees by burning charcoal and selling any firewood they could gather. Beatrice’s mother and father had abandoned her and moved away. She loved dance and sports, and she loved to be in school, but her grandparents had difficulty raising all of the fees. I let her know that AG Hair’s VP Creative, Kris Blizzard, had been using her photo on so many marketing materials that he began to feel quite connected to her, and wanted to sponsor her so that she could continue her high school education. Later that year, I flew to Australia to visit AG Hair’s Australian distribution partner. I spoke at their franchisee conference about One Girl Can and how AG was ‘giving back’ in Africa. They spontaneously decided to get involved and chose to fundraise for a new building at one of our schools. Months later, I learned that one franchisee, Andrea Headland, an artist, had decided to paint Beatrice’s portrait and offer it to the fundraising effort. Although it would be another year before the fundraiser would be ready to launch, Andrea continued to work on this painting. Then just this past February 2017 when I was in Uganda, Andrea sent me an image of the finished painting and a video showing each step and the care she undertook to create it, layer by layer. Coincidentally, the very next day we were scheduled to visit Beatrice’s home where she stayed with her grandparents. I downloaded the painting video and collected other images on my laptop of brochures and packages we’d created with Beatrice’s photo to show them. I was shocked at how remote and primitive her village was. While I had visited other villages, and grew up in South Africa, it still felt as though I was stepping back centuries in time. That some of the girls there are fortunate enough to have parents and guardians who encourage education is astounding as they themselves have not had access to schooling. How they manage to pay even a portion of the fees for school is truly remarkable, as most transactions are done through the barter system. Beatrice’s grandparents were not expecting four visitors from Canada. We received the warmest welcome, and I sat down in the shade of their hut with my laptop to show them the promotional images of Beatrice and the video of her portrait being painted. They had never seen a computer before and adapted to the technology in good stride. It was clear that they were extremely proud of Beatrice, of having her honoured by strangers thousands of kilometers away, and by this visit to her village. They thanked me for her scholarship and expressed their profound wishes that Beatrice might be the first in their family to escape poverty and the hopelessness that remained in the region after the 20-year reign of Joseph Kony. Two weeks later, and a year after the first trip, I was back in Australia launching their fundraiser. I showed the same images and video of Beatrice’s portrait, along with candid and beautiful pictures of her grandparents admiring the painting that had been done of their granddaughter. That night at the gala event, Beatrice’s painting was auctioned and sold for $5,300. The proceeds were sent to Beatrice’s school in her name, as a donation to buy the first sports equipment, gym shoes and uniforms the school has ever had. They will now be able to compete with other schools in soccer and volleyball; activities the girls at Atanga Girls Secondary School, and Beatrice especially, are looking forward to with great enthusiasm. 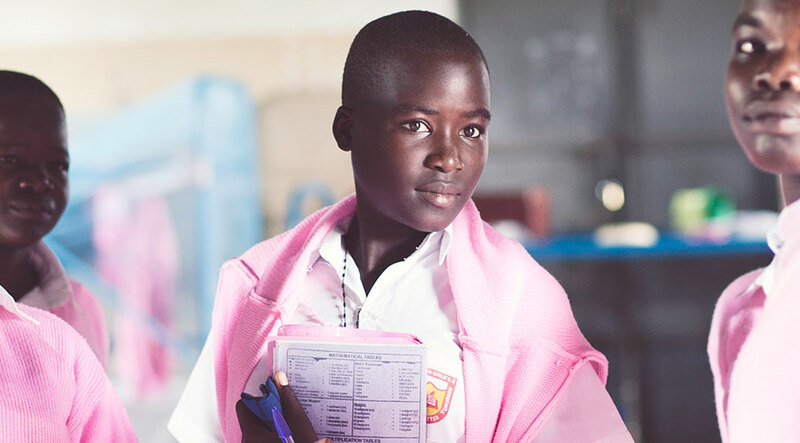 It doesn’t often happen that the global connections formed by One Girl Can and our supporters come so tangibly full-circle. Everyone played a part in this story, and everyone came to know each other, and themselves, a little better in the process. It was picture perfect, and proved the endless and creative ways in which lives can be impacted through the actions of others.